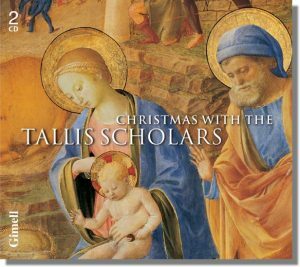 This album explores a wide range of Medieval and Renaissance Christmas music, including carols, motets, and masses. There are composers from England, Spain, Germany, France, and the Low Countries. There are familiar pieces (e.g. Es ist ein Ros’ entsprungen by Michael Praetorius [1571-1621], the same harmonization we sing as “I know a rose-tree springing,” #17 in our Hymnal) and some remarkable and rarely heard gems (e.g., the seven-part motet Beata es Virgo Maria by Philippe Verdelot [1480? -1532?]). Let me explain, First, Salisbury refers to the medieval city in southern England which was the site of a Norman cathedral. “Sarum” is an old name for Salisbury, and has long been used to designate the diocese there. Tropes were extra sections of texts inserted into a liturgical composition in order to expand and amplify its meaning, so making it relevant to particular occasions. In this example, the inserted texts actually replace the original words; instead of ‘Kyrie eleison’ (‘Lord, have mercy’), we hear ‘Deus Creator omnium, tu Theos ymon nostri pie eleison’ (‘O God, Creator of all things, our God, be gracious and have mercy on us’). This procedure occurs in all of the Kyrie’s nine invocations, and the text retains a few words of Greek amongst the Latin. Deus Creator omnium, tu Theos ymon nostri pie eleison. O God, Creator of all things, our God, be gracious and have mercy on us. Tibi laudes coniubilantes regum rex Christe oramus, eleison. We sing your joyful praises, O Christ, king of kings, have mercy on us. Laus, virtus, pax et imperium cui est semper sine fine, eleison. You to whom praise, might, peace and empire ever belong, have mercy on us. Christe rex unice Patris almi nate coaeterne, eleison. O Christ our king, only son and co-eternal with the all-provident Father, have mercy on us. Qui perditum hominem salvasti de morte reddens vitae, eleison. You who have saved lost man from death and given him life anew, have mercy on us. Ne pereant pascuae oves tuae Iesu, pastor bone, eleison. Lest the sheep of your pasture should perish, O Jesus, good shepherd, have mercy on us. Consolator Spiritus, supplices ymas te exoramus eleison. Holy Spirit, Comforter, we your suppliants pray you to have mercy on us. Virtus nostra Domine, atque salus nostra in aeternum, eleison. Lord our strength and our eternal salvation, have mercy on us. Summe Deus et une, vite dona nobis tribue misertus nostrique tu digneris eleison. One God, most high, grant us the gift of life, pity us we pray, and deign to have mercy on us. You can see the entire list of the contents of this unique Christmas collection at the Hyperion Records website, where you can also preview short excerpts from each of the piece.